What is an Agency Account? AppsFlyer Agency accounts are used by agency teams to track and measure their app marketing campaigns on behalf of advertiser clients. Key pre-install and post-install metrics are available to ensure that agencies are able to deliver optimal performance across their client portfolio. Available common KPIs include: impressions, clicks, installs, user loyality, cost, ROI etc. More details on the various reporting dashboards can be found here. By default, Agency IP is protected and Advertisers view agency activity as one complete media source. Agencies can choose to be transparent and thereby enable their clients to see a full breakdown of the source activity of the Agency. Agencies are not able to view any data that advertisers receive from other sources, including organic data. However, organic data access can be made available to agencies by the app owners upon explicit request. Advertiser accounts are geared towards serving the app and data-owner. Advertisers typically add their owned-properties to their account and determine the data-access levels required. Agency accounts are purpose-built to enable agency teams to efficiently track and measure their clients' app marketing campaigns across their client portfolio. Account structures permit knowledge-sharing between global agency teams and enable group-level ROI measurement, calculations, reporting and optimization. There are thousands of ad networks that are integrated with AppsFlyer. Most ad networks, very much like agencies, generate and drive installs for their app owner advertising clients. So, should you open an agency account or an ad network account? The fundamental difference between the two accounts is that an ad network account enables you to receive installs and in-app event information via postbacks, when originated by you. If you need real time postbacks and have the technical capabilities for this, perhaps you should register as an ad network rather than as an agency. Refer to the ad network integration guide for more information. 1. Complete the registration form here. 2. You are contacted by a member of AppsFlyer's Agency team to provide any necessary information. 3. Once your account is activated, you can add new team members. The agency's account owner is able to define new team members of the agency, that can get access to some or all of the apps accessible by the agency. For details of how to add new team members, click here. Once your AppsFlyer Agency account is created, you will want to receive access to your clients’ apps to prepare for campaigns. 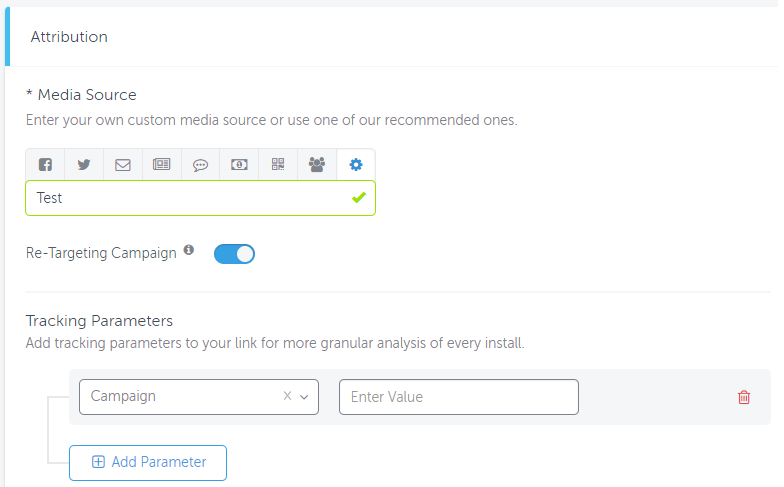 Once permissions have been granted, you can start the setup to run and measure your campaigns. Any agency individual and/or team requires permission from the app owner to gain access to the app's dashboard and to enable any configuration changes. Advertisers can provide access to any agency directly through the platform. The advertiser can search for the agency team within the Integrated Partner list and provide the required permissions. For more details regarding Agency permissions click here. Note that granting agency access permission may include access to raw data reports (related to the agency's campaigns only), as well as to aggregate data. Now that the agency account is set up, and you have permissions over your clients' apps, you can start running campaigns for them. The vast majority of ad networks, which are integrated partners of AppsFlyer's, use AppsFlyer's tracking links for attribution purposes. With these partners the tracking links are already there and advertisers can simply copy them directly from AppsFlyer's dashboard for use. For agencies the process is almost identical to that of the advertisers. Upon going to the setup window of any regular ad networks the tracking link is already there. The only difference is the automatic addition of the af_prt parameter to the tracking link. The Agency name that is passed in the af_prt parameter is always converted to lowercase. The value of af_prt is the agency name. Having af_prt with your agency name on a tracking link that results in new installs enables attributing new installs to your agency account. Without af_prt a new install can't be attributed to any agency account, and therefore it gets attributed directly to the ad network. Some non-SRNs require (or allow) advertisers to send them postbacks for devices that aren't attributed to them. Some examples for All-Installs networks are Vungle, Wechat, Startapp, Unity ads and more. How to setup agency tracking with All Installs/Launches Networks? Working with these networks entails sending information from installs that are not brought by the agency. Therefore, these networks require the advertiser to configure them BEFORE the agency. 3. 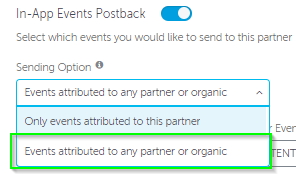 Under the Integration tab, the Advertiser goes to Default Postbacks and selects "Launches attributed to any partner or organic"
If your agency has any owned media, such as an Email or Phone users data base, web site banners etc. you can drive and track all originated installs from it. To track installs from owned media you need to create a custom tracking link, which automatically contains af_prt with your agency's name for correctly attributing to your agency. Self-reporting networks, such as Facebook, Google Ads or Twitter do not use tracking links of external companies. Instead, each network has its own methods and APIs AppsFlyer uses to communicate new installs, in-app events etc. Below you can find the instructions for agencies to run campaigns with each of the self-reporting ad networks. As an official measurement partner of Facebook, AppsFlyer enables Agencies to accurately track and measure any Facebook spend on behalf of advertiser clients, directly from their Agency Account. For Facebook campaigns, it is necessary for the advertiser to initially set up Facebook tracking, even if only the agency runs its Facebook traffic. All Facebook and Twitter campaigns must start with the Agency account name (as defined in the AppsFlyer platform) followed by "_". Campaigns, which are not named as mentioned, become visible to the advertiser, but remain invisible to the agency account. The agency name is CASE SENSITIVE. To establish the connection between AppsFlyer and Twitter, the advertiser MUST select an active account in Twitter's partner page in AppsFlyer's dashboard, so at least one Twitter account is checked. Afterwards, the agency needs to connect its Twitter account directly from its own agency dashboard. Agencies cannot modify lookback windows and retargeting toggle and need to ask the advertiser to perform these changes if they're needed. Besides, agencies cannot modify any in-app event postbacks sent to Twitter, and only the advertiser is able to map in-app events with Twitter, even if only the agency is running Twitter for the app. To map the in-app events, the advertiser needs to select the Events attributed to any partner or organic option. agencyx runs a Facebook campaign called agencyx_brilliantcampaign, which is visible to it. agencyz runs a Twitter campaign called AgencyZ_whathaveidonewrong, but doesn't see any results, as the agency name part of the campaign is different to the defined agency name (capital A and Z). Contact agency@appsflyer.com if you have any questions regarding this. For details of agency configuration for Google Ads campaigns, click here. For details of agency configuration for Apple Search Ads campaigns, click here. 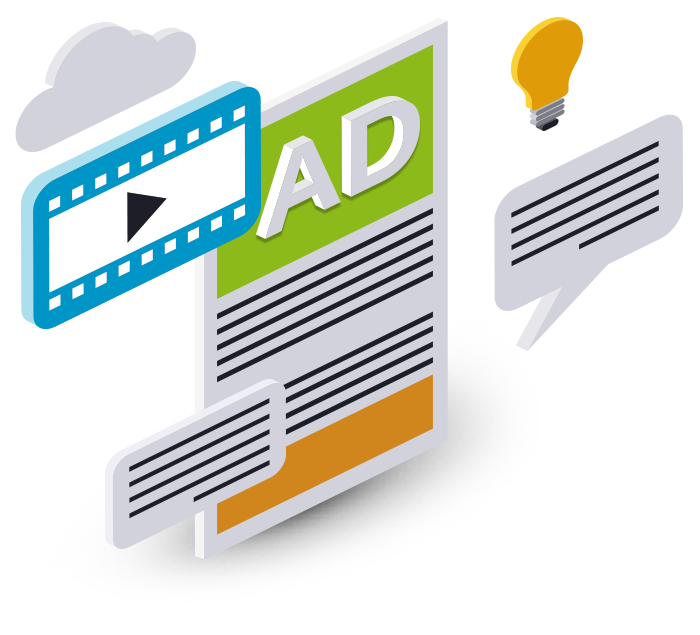 For details of agency configuration for DoubleClick campaigns, click here. For details of agency configuration for Snapchat campaigns, click here. Agencies can be given permission to configure In-App Event Postbacks (including the af_app_opened event) to ad networks, upon receipt of permission from the Advertiser. Permission can be given by advertisers seamlessly through the platform. Ad networks get visibility to their set up done by advertisers, but not when it's done by agencies. 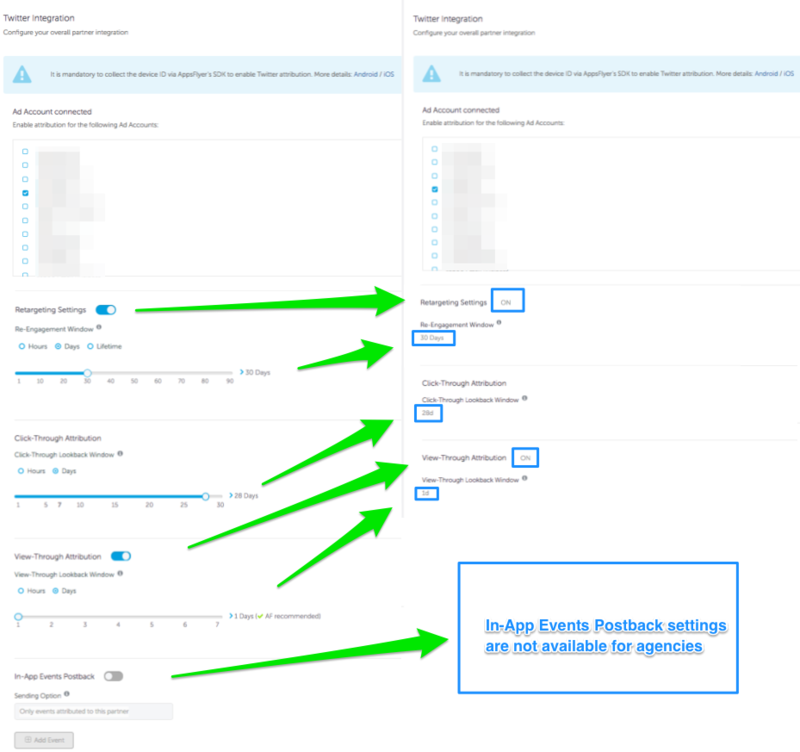 Therefore, when an agency, but not the advertiser, maps in-app events for postbacks to a network, the ad network sees this section as inactive, although it is actually active for the agency. Advertisers and agencies mostly cannot access the same data on AppsFlyer's dashboard, reports etc. As agencies are usually responsible for but a part of the advertisers traffic, the agencies access to data is limited in comparison. The following article breaks down these differences. Both types or reports can be accessed via the Export Data page on AppsFlyer's dashboard. Due to Facebook and Twitter's terms of service, agencies, which are considered as 3rd parties, do not have access to raw data reports traffic, coming from Facebook and Twitter. For all AppsFlyer articles related to Performance Reports, click here. Aggregate reports for retargeting campaigns are also available. Access to aggregated organic data reports is only available upon advertiser permission. Raw Data Reports, also known as Device-Level Data Reports, contain abundance of attribution information, from the traffic sources of the agency. For all AppsFlyer articles related to Raw Data Reports, click here. Agencies can receive access to retention data, upon receipt of permission from the Advertiser. Permission can be given by advertisers through the platform. More details on the retention report for agencies can be found here. Agencies are able to create app-specific or OneLink tracking links for apps of client accounts. However, when creating OneLink templates, agencies are only allowed to associate apps that are owned by them, and not that they are partners of. Agencies see apps in the time zone and currencies set by the app owners. Agencies can enable advertisers to view all of their traffic data for the app they are promoting. By default, advertisers view an agency's activity as one media source. This means that the media source information coming from agencies, is not available to the advertiser on the dashboard pages, or in the raw data reports. Agencies that do wish to share the media source data, can become transparent to the client. Agencies can enable Get Cost Data when configuring an integrated partner that supports cost data. Overview page - cost data is visible in the Aggregated Performance Report in the Overview page.